Dendritic cells (DC) are increasingly prepared in vitro for use in immunotherapy trials. Mature DC express high levels of surface molecules needed for T cell activation and are superior at antigen-presentation than immature DC. Bacillus Calmette-Guerin (BCG) is one of several products known to induce DC maturation, and interferon (IFN)-γ has been shown to enhance the activity of DC stimulated with certain maturation factors. In this study, we investigated the use of IFN-γ in combination with the powerful maturation agent, BCG. The treatment of immature DC with IFN-γ plus BCG led to the upregulation of CD54, CD80, and CD86 in comparison with BCG treatment alone. In MLR or recall immune responses, the addition of IFN-γ at the time of BCG-treatment did not increase the number of antigen-specific T cells but enhanced the development of IFN-γ-producing Th1 cells. In primary immune responses, on the other hand, BCG and IFN-γ co-treated DC stimulated higher proportions of specific T cells as well as IFN-γ secretion by these T cells. Thus the use of IFN-γ during BCG-induced DC maturation differentially affects the nature of recall versus naïve antigen-specific T-cell responses. IFN-γ co-treatment with BCG was found to induce IL-12 and, in some instances, inhibit IL-10 secretion by DC. These findings greatly enhance the potential of BCG-matured dendritic cells for use in cancer immunotherapy. Dendritic cells (DC), the professional antigen presenting cells of the immune system, are increasingly prepared in vitro for use in the experimental immunotherapy of cancer. The production of DC with optimal immunostimulatory properties and their exploitation in cancer therapy requires an understanding of the biology of these cells during in vitro culture. Various protocols for the culture of these cells have been established with the specific purpose of human clinical use, and various advantages ascribed to each [1–6]. Recent improvements include the use of serum-free media [7, 8], and the development of fully closed purification and culture systems [5, 6]. Maturation of DC is the process that converts immature DC, which are phenotypically similar to skin Langerhans cells, to mature antigen presenting cells that migrate to lymph nodes. This process results in the loss of the powerful antigen uptake capacity that characterizes immature DC and in the upregulation of co-stimulatory molecule expression and of various cytokines [9, 10]. Known maturation protocols are based on the environment that DC are believed to encounter after or during exposure to antigens. The best example of this approach is the use of monocyte-conditioned media (MCM). MCM is generated in vitro by culturing monocytes and then using the culture supernatant fluid as a source of maturation factors. The major components in MCM responsible for maturation are the pro-inflammatory cytokines interleukin-1 beta (IL-1β), IL-6 and tumor necrosis factor alpha (TNF-α). Other maturation protocols include TNF-α either used alone  or in combination with other factors like prostaglandin E2 (PGE2) or vasoactive intestinal peptide , poly-dIdC  bacterial lipopolysaccharide (LPS) , as well as mycobacteria or components of mycobacteria, such as specific cell wall constituents [17–19]. Fully mature DC differ qualitatively from immature DC. They express higher levels of MHC class I and class II antigens, cellular adhesion molecules such as CD54, and of T cell co-stimulatory molecules such as CD40, CD80 and CD86 . These changes increase their capacity to activate T-cells as they increase antigen density on the surface, as well as the magnitude of the T cell activation signal through the counterparts of the co-stimulatory molecules on the T-cells, such as CD28. In addition, mature DC produce a variety of cytokines, which stimulate and direct the T cell response. Two of these cytokines are interleukin-10 (IL-10) and IL-12. These cytokines have opposing effects on the direction of the induced T cell response: IL-12 induces a Th1 type response [20, 21] whereas IL-10 inhibits such response . The former is particularly desirable in cancer immunotherapy: a Th1 type response results in the induction and differentiation of cytotoxic T lymphocytes (CTL), which constitute the effector arm of the immune system and most effective in combating tumor growth . IL-12 also induces growth of natural killer (NK) cells , and has anti-angiogenic activity , both of which are effective anti-tumor weapons. Therefore, the use of DC that produce IL-12 is, in theory, optimally suited for use in the active immunotherapy of cancer. BCG has an extensive history of use in cancer immunotherapy: intravesical administration of live BCG has proven effective for the treatment of bladder cancer . The effects of BCG administration are postulated to be via the induction of an immune response that attacks cancer cells. The specific role of BCG in this response is probably that of a generalized inducer of immune reactivity, as well as an adjuvant in the presentation of tumor antigens to the immune system [27, 28]. The use of BCG in active immunotherapy using dendritic cells has the potential of combining these effects with the established capacity of BCG to induce dendritic cell maturation. Also, pharmaceutical-grade BCG is available commercially, which adds the advantage of use in human clinical trials. BCG is a powerful maturation agent for dendritic cells, with the ability to up-regulate the maturation marker CD83 as well as MHC molecules and the co-stimulatory molecules CD80 and CD86, concomitant with a reduction in endocytic capacity [17–19, 29]. BCG-derived lipoarabinomannan was found to increase in vitro production of IL-12, IL-6 and TNF-α . Recent reports demonstrated enhancement of IL-12 production by dendritic cells that are matured using maturation factors such as LPS and CD40 through the addition of interferon-gamma (IFN-γ) [31, 32]. Both LPS and CD40 have the capacity to induce the production of small amounts of IL-12 during maturation in vitro , and it is possible that the addition of IFN-γ merely enhances that potential. It was therefore of interest to us to study the combination of BCG and IFN-γ for dendritic cell maturation, to determine whether the beneficial effects of this cytokine extend to a maturation agent that has not been reported to induce IL-12 secretion. BCG (BCG-Tice®, Organon Teknika, Durham, NC), inactivated in-house by heat and formalin-fixation, and IFN-γ (Actimmune®, InterMune Pharmaceuticals, Brisbane, CA) were used in the maturation of DC. Inactivated Influenza A virus (Chemicon, Temecula, CA), Influenza M1 protein from strain A/PR/8/34 (Virodynamics Corp., New York, NY), and KLH (Sigma Chemical Co., St. Louis, MO), were loaded into DC in experiments involving antigen-specific responses, PMA (Sigma) and sterile, azide-free, low-endotoxin monoclonal anti-human CD3 antibody (BD Pharmingen, San Diego, CA), rhIL-2 (Peprotech, Rocky Hill, NJ) and rhIL-15 (Peprotech) were utilized in the preparation of antigen-specific cells, and 3H-thymidine (Perkin Elmer Life Sciences, Boston, MA) was used in assays involving cell proliferation. For western blotting, polyclonal anti-pY STAT1 antibodies were purchased from UpState Biotechnology (Lake Placid NY). The anti-STAT1α91 monoclonal antibody was purchased from Santa Cruz Biotechnology (Santa Cruz, CA). The anti-α-tubulin monoclonal antibody was purchased from Sigma Chemical Co. (St. Louis, MO). Human peripheral blood mononuclear cells (PBMC) were isolated from fresh leukaphereses via density gradient centrifugation using Ficoll (Sigma). The PBMC were cryopreserved in 90% serum and 10% dimethyl sulfoxide (DMSO) until used. These PBMC were used for DC culture and also for preparing T-cells used in bioassays. Enriched T-cells were prepared from allogeneic PBMC by negative depletion using anti-HLA-DR monoclonal antibody-conjugated paramagnetic beads (Dynal, Lake Success, NY). Previously frozen PBMC were thawed in warm AIM-V medium (Life Technologies, Gaithersburg, MD), washed once with PBS, and resuspended at 5–10 × 106 cells/ml in Opti-MEM™ medium (Invitrogen Corp., Carlsbad, CA) supplemented with 1% heat-inactivated pooled human serum AB (Gemini BioProducts, Woodland, CA). Ten ml of this cell suspension was dispensed into each T-75 culture flask and incubated for 1 h. After the incubation, non-adherent cells were resuspended and aspirated out, followed by stringent washing with cold PBS to remove loosely adherent cells. Fifteen ml of serum-free X-VIVO-15™ medium (BioWhittaker, Walkersville, MD) supplemented with 500 IU/ml each of rhGM-CSF (Leukine™, Immunex, Seattle, WA) and rhIL-4 (R&D Systems, Minneapolis, MN, and alternatively Peprotech) was added to each flask and the adherent cells (monocytes) cultured for 6 days which typically resulted in >90% CD11c+ HLA-DR+ "immature" DC that were >90% viable (determined by trypan blue exclusion). For maturation, these DC were treated with BCG or BCG plus IFN-γ for 24–48 h as described in the experiments below. Cell surface molecule expression was evaluated by staining DC with the following antibodies (BD Pharmingen): FITC-labeled anti-CD80, anti-CD86, anti-Vβ17, PE-labeled anti-CD54, PerCP-labeled anti-HLA-DR, or CyChrome-labeled anti-CD8 and anti-CD4. Cells were suspended in staining buffer (PBS containing 1% BSA and 0.01% sodium azide, pH 7.2) at 5 × 106 cells/ml, and 50 μl aliquots stained with individual antibodies, or with combinations of antibodies. For intracellular staining, the Cytofix/Cytoperm™ kit (BD Pharmingen) was utilized with FITC-labeled anti-TNF-α and PE-labeled anti-IFN-γ, anti-IL4 or anti-IL-2, following the manufacturer's instructions. To enable optimal detection, cytoplasmic cytokines were allowed to accumulate by including GolgiPlug™ (BD Pharmingen) in the last 6–16 hours of culture before staining. Mixed leukocyte reaction (MLR) cultures were set up by adding 2 × 105 enriched allogeneic T-cells to specific numbers of DC in triplicate wells of a 96-well microculture plate. Five days later culture supernatants collected for evaluating IFN-γ secretion by ELISA or the cultures were pulsed with 3H-thymidine for an additional 24 h before the cells were harvested onto glass fiber filters using a FilterMate™ harvester (Packard, Meriden, CT) and the incorporated radioactivity quantified in a TopCount™ scintillation counter (Packard). For co-stimulatory molecule blocking studies sterile, azide-free, and low-endotoxin monoclonal antibodies specific for CD54, CD80, CD86, and an isotype control (BD Pharmingen) were added to the DC at 1 μg/well for 1 h at the initiation of the 6 day culture, prior to the addition of T-cells. Monocyte derived DC from normal donors were loaded with KLH or inactivated Influenza A virus (30 – 40 μg/200 μl X-VIVO-15™ medium for 1 h, followed by 3–4 washes with medium) and matured using BCG, with or without IFN-γ for 18 to 24 hours. To stimulate KLH or Influenza A specific T cells, PBMC were stimulated with the antigen loaded autologous DC. The lines were cultured in AIM-V media supplemented with 5% heat inactivated human AB serum and given 20 U/mL recombinant human (rh) IL-2 and 5 ng/mL rhIL-15 every 2 – 3 days of culture as needed. The KLH-specific primary cell lines were re-stimulated every 12 to 14 days with KLH-loaded autologous DC. These primary T cell lines were tested for antigen specificity by proliferation assay and IFN-γ release after at least three rounds of such in vitro stimulation. To test for antigen specificity, unloaded or antigen-loaded (Infuenza A or KLH) DC were irradiated (2000 cGy) and distributed over the wells of a 96-well tissue culture plate at 2 × 103 cells/well. KLH-specific T cells stimulated 10 – 14 days earlier, were titrated into the wells at ratios of 50:1, 25:1 and 12.5:1 T cells to DC. Assays were performed using AIMV + 5% heat inactivated human AB serum. After 44 ± 4 hours 100 μl of media was removed for ELISA purposes, 1 μCi of 3H-Thymidine was added per well, and the cells were incubated for an additional 18 hours. Cells were thereafter harvested and 3H-thymidine incorporation was measured using a FilterMate™ (Packard) cell harvester and the incorporated radioactivity quantified in a TopCount™ scintillation counter (Packard). Cytokines in supernatants from DC cultures with different treatments or co-cultures with T-cells were quantified by ELISA. Anti-IL-10, anti-IL-12, and anti-IFN-γ antibody pairs and recombinant cytokine standards were purchased from BD Pharmingen. The manufacturer's recommended ELISA protocol were followed to determine cytokine concentrations in the supernatants. The sensitivity of each ELISA was at least 15 pg/ml. We had previously found that DC respond to killed BCG mycobacteria with increased expression of MHC class I and class II molecules, CD54, CD80 and CD86, and CD83. These phenotypic consequences of maturation induced by BCG have also been described by others, and are similar to those obtained using other maturation factors such as LPS or monocyte-conditioned media. To investigate the consequences of IFN-γ addition to BCG-induced DC maturation, we first tested the expression of maturation-associated markers. 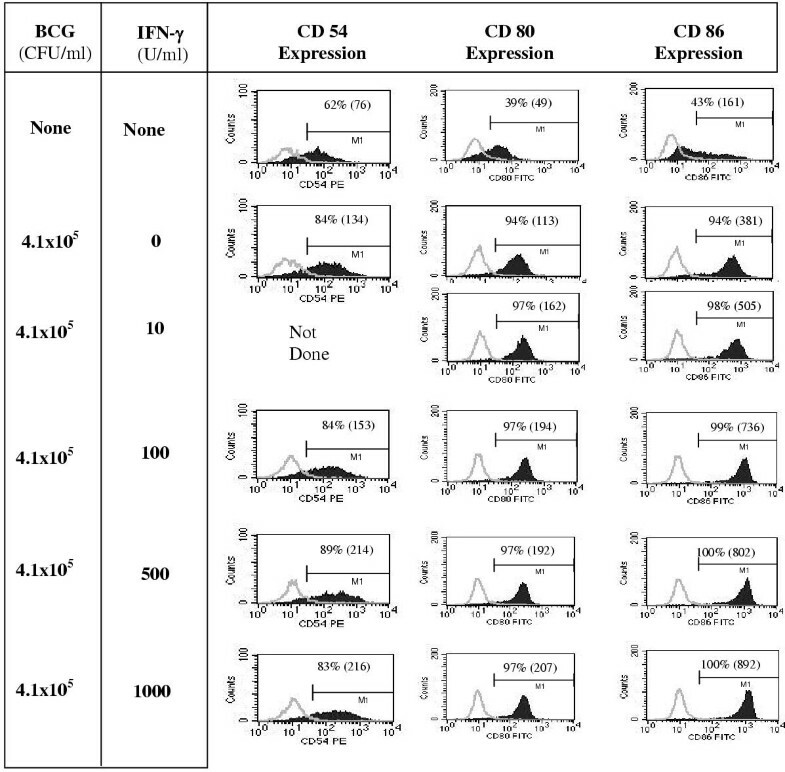 Dendritic cells matured for 48 h with BCG alone, or in combination with various concentrations of IFN-γ were analyzed by flow cytometry for CD54, CD80, and CD86 expression. Figure 1 shows the upregulation of DC cell surface molecules in response to a 48 h exposure to increasing amounts of IFN-γ added to a fixed concentration of inactivated BCG. As expected, compared to immature DC a larger percentage of BCG-matured DC expressed co-stimulatory molecules, and this percentage was not affected by IFN-γ co-treatment. In contrast, the level of expression of these molecules on the cells was upregulated by IFN-γ. At the highest dose tested (1000 U/ml), there was an approximately 2-fold increase in CD54 and CD80 expression, and a 3-fold increase in CD86 expression, as measured by mean fluorescence intensity (MFI). The expression levels of CD83, MHC class-I, and MHC class-II were not different between BCG alone versus BCG and IFN-γ co-treatment, but higher than that of immature DC by at least 2-fold (data not shown). 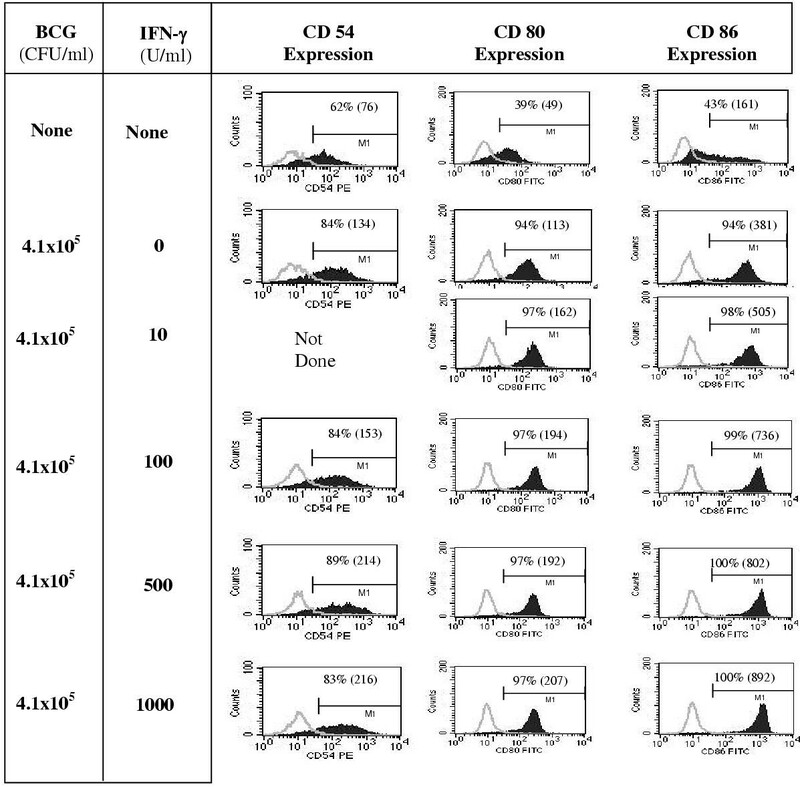 IFN-γ in combination with BCG stimulates enhanced DC surface expression of CD54, CD80, and CD86 DC, derived from 6-day monocyte cultures with GM-CSF and IL-4, were left untreated, matured with 4.1 × 105 CFU/ml of BCG alone, or in combination with various concentrations of IFN-γ for an additional 2 days in the presence of GM-CSF and IL-4. Cells were harvested and analyzed by flow cytometry for CD54, CD80, and CD86 expression. DC-gated (based on light scatter properties) data are shown (from a representative experiment out of three similar experiments). Isotype control staining is overlaid and shown by the light gray curve. Percent positive cells are shown in each panel and mean fluorescence intensity indicated within parentheses. To investigate whether this potentiating effect of IFN-γ on BCG-induced DC maturation was restricted to surface molecule expression alone, we evaluated the production of TNF-α. DC were matured for 36 h as above and the proportion of TNF-α-producing DC was determined by intracellular cytokine staining. As indicated in Figure 2, IFN-γ induced over a 3-fold increase in the proportion of BCG-matured DC producing TNF-α. Furthermore, the TNF-α levels on a per-cell-basis were noticeably higher in DC matured with the combination of BCG plus IFN-γ compared to those DC matured with BCG alone. These initial results suggested that IFN-γ enhances BCG-induced DC maturation. 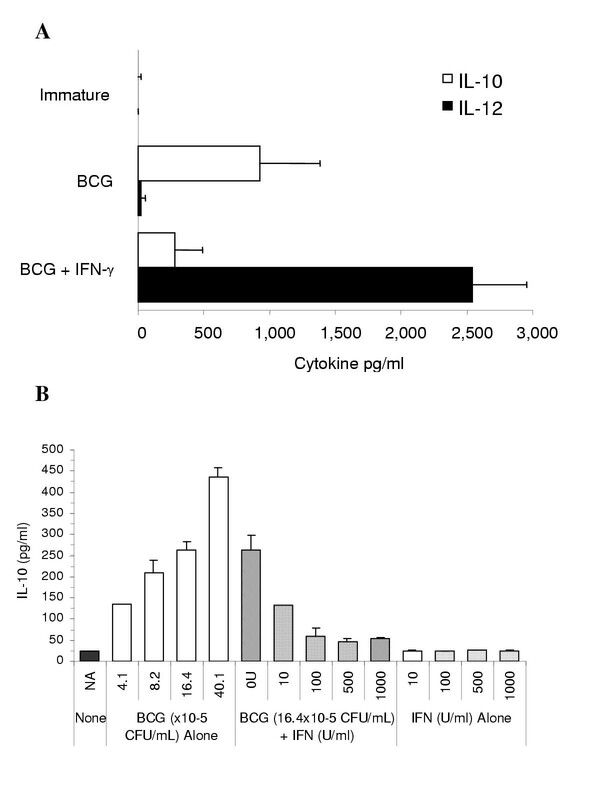 IFN-γ treatment in combination with BCG induces TNF-α in a higher percentage of dendritic cells than treatment with BCG alone DC were treated with 1.6 × 106 CFU/ml of BCG, with or without 1000 U/ml IFN-γ, or left untreated (immature). Twenty hours later GolgiPlug™ was added to inhibit cytokine secretion and the cells were cultured for an additional 16 h prior to intracellular staining with anti-TNF-α-FITC and extracellular staining with anti-HLA-DR, DP, DQ-PerCP. Data shown here are from a representative experiment out of four similar experiments. The observed increase in co-stimulatory molecules and TNF-α production suggested the potential for enhanced T cell stimulation by DC that were matured using BCG and IFN-γ as opposed to those matured with BCG alone. We tested this hypothesis by performing a mixed lymphocyte reaction. Immature DC, or DC matured with BCG alone or BCG plus IFN-γ for 24 h, were cultured with enriched allogeneic T cells. As shown in Figure 3A, the DC matured in the presence of BCG alone or BCG plus IFN-γ were both found to induce stronger T cell proliferative responses than immature DC, while there was no significant difference between DC matured in either manner. 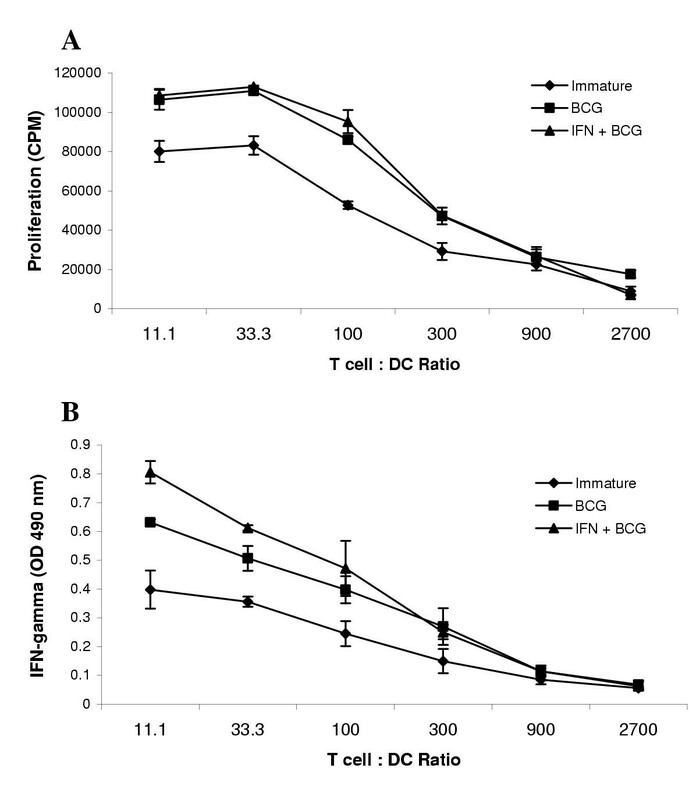 On the other hand, IFN-γ co-treated DC induced significantly greater IFN-γ secretion by T-cells responding to alloantigenic stimuli, especially at lower T-cell:DC ratios, than did DC matured in the absence of IFN-γ (Figure 3B). These data provided an initial indication that IFN-γ addition during BCG-induced maturation modulates a change in the quality but not the quantity of the ensuing T-cell response. IFN-γ treatment affects the quality but not quantity of the allogeneic T cell MLR response stimulated by BCG matured DC DC were treated with 4.1 × 105 CFU/ml of BCG alone, BCG plus 1000 U/ml IFN-γ or left untreated (immature) for 24 h prior to mixed leukocyte culture. Varying numbers of DC were added to 2 × 105 enriched T cells in triplicate wells of a 96-well microculture plate and cultured for 5 days. The cells were pulsed with 3H-thymidine for an additional 24 h before harvesting and quantitation of incorporated radioactivity in a scintillation counter (A). Immediately preceding the 3H-thymidine pulse, culture supernatants were collected for evaluating IFN-γ secretion (B). Results shown in each panel are from a representative experiment out of three similar experiments. Next, we investigated whether the qualitative immunopotentiating effect of IFN-γ on BCG-induced DC maturation also applies to antigen-specific T cell responses. The recall T-cell response to influenza was used as the model system to address this question. DC from an HLA-A2.1+ donor were loaded with inactivated influenza-A virus or KLH, followed by maturation with BCG, in the presence or absence of IFN-γ. After maturation the DC were washed and mixed with autologous PBMC at a 10:1 (PBMC: DC) ratio. Seven-to-eight days later the resulting cell lines were counted and analyzed by flow cytometry for the percentage of Vβ17+CD8+ T cells, which are a population of T-cells that react specifically with the immunodominant HLA-A2*01-restricted matrix (M1) protein peptide . Figure 4A shows the data expressed as a percentage of the response seen using Influenza A-pulsed immature DC ("percent of control"). We found that both maturation conditions led to the expansion of Vβ17+ T-cells to the same degree, but were both significantly higher than that induced by immature DC. From this it is apparent that memory T-cells will expand in response to mature antigen-loaded DC, and the level of expansion was not dependent on the presence of IFN-γ during maturation. 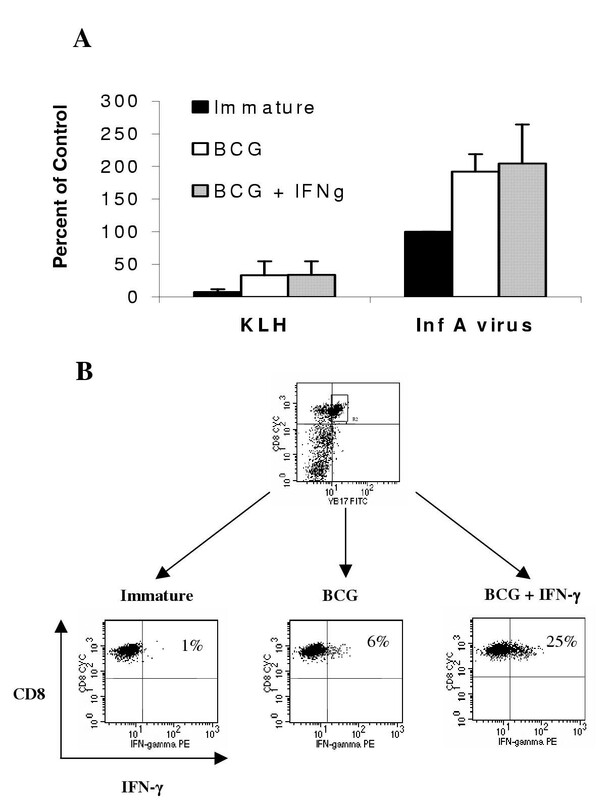 IFN-γ treatment in combination with BCG or BCG alone induces similar proportions of antigen-specific Vβ17 + T cells in recall responses, but which differ in IFN-γ producing ability DC were loaded with inactivated Influenza A virus or control protein (KLH) by pulsing with these proteins for 1 h followed by 2 hours of incubation before maturation with BCG (1.6 × 106 CFU/ml), BCG and IFN-γ (1000 U/ml), or left untreated (immature). After 20 hours of maturation, the DC were washed and autologous PBMC were added at a 10:1 (PBMC:DC) ratio in AIM-V media containing IL-2 and IL-15. Seven or eight days later the resulting cell lines were counted, analyzed for the percentage of Vβ17+CD8+ expression on T cells by flow cytometry, and the results calculated as a percent of the response seen using Influenza A-pulsed immature DC as the control (A). The influenza A virus-specific Vβ17+CD8+ T cells were re-stimulated for 40 h (including addition of GolgiPlug™ in the last 16 h) with immature or BCG ± IFN-γ matured DC loaded with Influenza M1 protein and evaluated for intracellular IFN-γ (B). Data in panel A are combined from three separate experiments and data in panel B are from one representative experiment out of four similar experiments. Our next question was whether there were qualitative changes resulting from the change in maturation conditions. The influenza A virus-stimulated T cells generated above were re-stimulated for 40 h with Influenza M1 protein-loaded DC and evaluated for IFN-γ production by intracellular cytokine staining. As shown in Figure 4B, only 6% of the cells that were expanded using DC matured with BCG alone produced IFN-γ. On the other hand a 4-fold higher proportion (25%) of the cells that were expanded using DC matured with BCG and IFN-γ produced this cytokine. Using similar assays we were unable to detect production of IL-4, IL-5 or IL-10 by these T-cells (data not shown). These results mirrored our findings from the earlier MLR experiments, that the addition of IFN-γ during DC maturation modulated the qualitative response of T-cells. To assess the capacity of DC to induce responses in naïve T-cells, we stimulated PBMC three times with autologous DC loaded with KLH and matured with BCG, in the presence or absence of IFN-γ. The resulting T cell lines were tested for antigen specificity by standard proliferation assay. Only those lines that were generated using DC matured with BCG and IFN-γ proliferated in response to KLH, and not to the control antigen Influenza-A or unloaded DC (Figure 5A). When these lines were non-specifically stimulated with anti-CD3 and PMA, the T-cells that were expanded using DC matured with BCG and IFN-γ produced IFN-γ whereas those expanded using DC matured with BCG alone did not. No significant differences were seen on IL-2 and IL-4 production (Figure 5B). 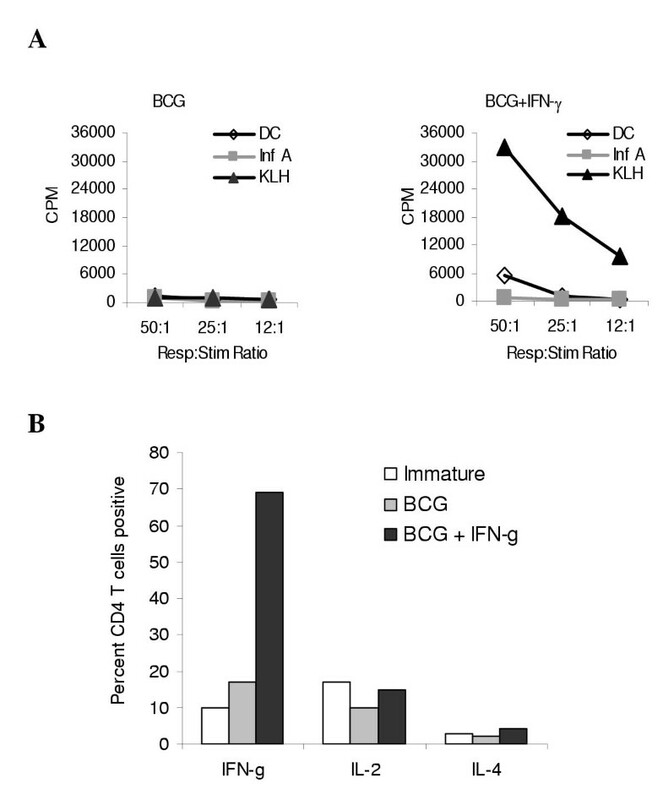 BCG and IFN-γ matured DC induce primary CD4 + Th1-type T cell responses as opposed to BCG matured or immature DC PBMC were stimulated with KLH-loaded DC matured with either BCG alone (1.6 × 106 CFU/ml) or BCG and IFN-γ (1000 U/ml). Every 10–14 days the cell lines were re-stimulated with the same DC used in the initial in vitro stimulation. After 3–5 rounds of such stimulation, the resulting cells were analyzed for KLH-specific proliferation in a 3H-thymidine incorporation assay as described in Materials and Methods (A). The KLH-specific T cells were non-specifically stimulated with anti-CD3 and PMA for 8 h, including GolgiPlug™ for last 6 hours. Subsequently the cells were stained for intracellular IFN-γ, IL-4 or IL-2 (B). The data are from one representative experiment out of four similar experiments. Given the above findings of enhanced capacity of DC matured with BCG plus IFN-γ to induce Th1 cells under several experimental conditions, we sought to examine next whether this effect of IFN-γ was mediated via modulation of the Th1:Th2 cytokine balance among DC-produced cytokines. Culture supernatants from DC matured for 24 h using BCG alone, or in combination with increasing concentrations of IFN-γ, were tested for the presence of IL-12 and IL-10 by ELISA. In the presence of IFN-γ, production of IL-12 p70 was substantially increased upwards of several ng/ml while the production of IL-10 was reduced (Figure 6A). The reduction of IL-10 production, though not seen in samples from all donors, was confirmed by the results of several experiments represented in Figure 6B. DC were cultured with various concentrations of BCG, or IFN-γ in combination with a fixed concentration of BCG, or IFN-γ alone. It was found that while BCG induced IL-10 secretion in a dose-dependent manner, IFN-γ co-treatment inhibited its production. IFN-γ alone produced no effect on IL-10 secretion. Apparently, the addition of IFN-γ reverses the pattern of cytokine production by DC in response to BCG-induced maturation, to a mixture that is more favorable to induction of a Th1 response. The addition of IFN-γ during DC maturation with BCG induces secretion of IL-12 and suppresses IL-10 production IL-10 and IL-12 p70 cytokine were quantified in DC culture supernatants by ELISA after 24 hour maturation with BCG (1.6 × 106 CFU/ml) in the presence or absence of IFN-γ (1000 U/ml). Data shown represent the mean ± SD of IL-10 and IL-12 concentrations from four experiments (A). Increasing concentrations of BCG induces IL-10 secretion by DC in a dose dependent manner (in some donors) that is suppressed by the addition of IFN-γ. Data shown represent the mean ± SD of IL-10 concentrations obtained from three separate but identical experiments (B). Another level of signal modulation by IFN-γ during BCG-induced maturation is possibly via the induction of additional co-stimulatory cell surface molecules that, in turn, mediate the potentiation of the ensuing immune responses by these DC. To address this, MLR cultures were set up as earlier, and certain co-stimulatory molecules, or a combinations of them, were blocked using specific antibodies. 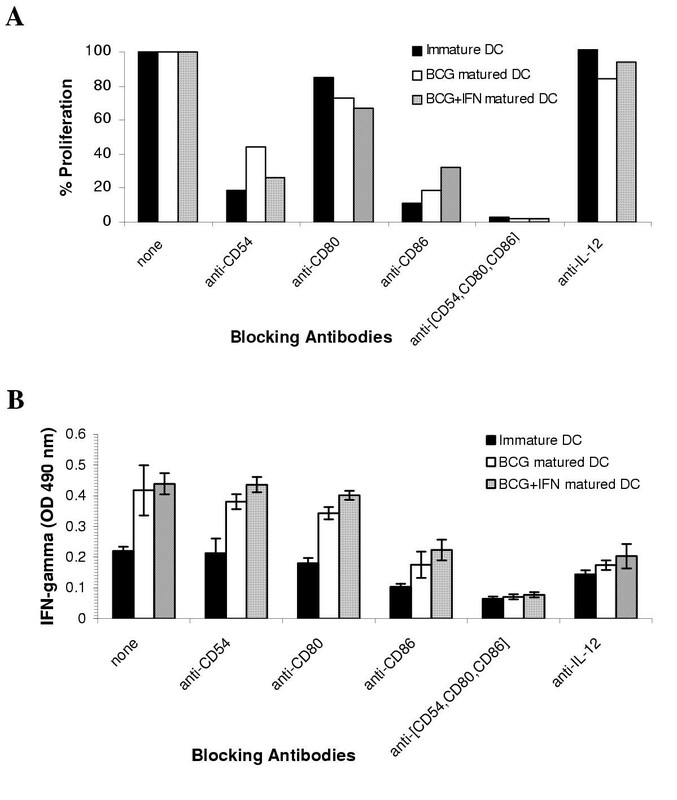 Immature or matured DC were exposed to anti-CD54, anti-CD80, anti-CD86, or isotype-matched control blocking antibodies for 1 hour prior to addition of T-cells. Proliferation (Figure 7A) and IFN-γ secretion (Figure 7B) were measured. Blocking CD54, CD80, and CD86 together abrogated proliferation by over 95%, independent of the type of DC maturation protocol used. Similarly, blocking these molecules inhibited 75% of the IFN-γ secreted, indicating that the same co-stimulatory molecules may be responsible for T cell activation. This data, however, does not exclude the induction or upregulation of new co-stimulatory molecules. As expected, there was a reduction of IFN-γ production by the T cells in the presence of anti-IL-12 antibodies (Figure 7B), confirming that IL-12 modulated the qualitative responses T cells in this system. T cell stimulation by DC matured with BCG alone or in combination with IFN-γ is mediated via identical co-stimulatory molecules DC were treated with 4.1 × 105 CFU/ml of BCG alone, BCG plus 1000 U/ml IFN-γ or left untreated (immature) for 24 h. The DC were harvested, washed, and placed in mixed leukocyte culture with allogeneic T cells at 1:100 ratio in triplicate wells of a microculture plate. Blocking antibodies were added to the DC at 1 μg/well for 1 h prior to the addition of T cells. Five days later culture supernatants collected for evaluating IFN-γ secretion by ELISA (B). The cells were pulsed with 3H-thymidine for an additional 24 h cells before harvest and quantification of incorporated radioactivity in a scintillation counter (A). Results shown in each panel are from one of two identical experiments. The interaction between dendritic cells and T cells is governed by many factors, all of which are subject to regulation . These factors include the availability of antigenic peptides associated with MHC molecules, the density of these MHC molecules on the cell surface and the relative occupation of these molecules with antigenic peptides. Other factors include the expression, density, and balance of the co-stimulatory molecules such as CD80 and CD86 and their levels of expression relative to negative stimulatory molecules like CTLA-4 and FasL [10, 35–37]. In addition to these cell-bound factors, the interaction is further governed by soluble factors that include cytokines and chemokines. Active immunotherapy for cancer generally requires the breaking of tolerance to self-antigens. The minimal requirements for accomplishing this are not known, but data from animal experiments support the notion that high levels of antigen density together with the appropriate co-stimulatory molecules and cytokines like IL-12 may be required [10, 38–40]. This paper describes a combination of maturation factors for human DC which are compatible with clinical protocols and which accomplish all of the above. Maturation with BCG and IFN-γ increases MHC expression and the expression of CD80 and CD86, and simultaneously induces the production of IL-12. This induction of IL-12 p70 secretion is remarkable since maturation with BCG alone is not associated with significant IL-12 production, which could suggest that the use of BCG as a maturation agent predisposes the DC to induce primarily Th2 like responses. Our data show that the addition of IFN-γ to BCG results in the production of high levels of IL-12, thus creating the potential for strong Th1 type responses. Besides this qualitative change, the addition of IFN-γ also has quantitative aspects. It up-regulates the expression of cell surface molecules that are involved in DC-T cell interactions, and increases the production of other cytokines like TNF-α. In our investigations into the effects of these changes on the outcome of in vitro T cell activation we found functionally distinct results. When using MLR or recall responses and looking at cell proliferation, we found that DC that are matured with BCG are equivalent to those matured with BCG and IFN-γ. However, in both of these cases, we also found that the responding cells had a greater propensity to produce the Th1 cytokine IFN-γ, if IFN-γ was present during DC maturation with BCG. This finding is in line with the well established IL-12 – IFN-γ axis, and supports the notion that T cell activation as measured by proliferation is independent of directional instruction of the T cell response towards Th1. [41, 42]. Dendritic cells are required for the induction of primary T cell responses, both in vivo and in vitro [10, 43–46]. We have attempted to induce primary responses against KLH, and were unsuccessful when we used DC matured with BCG alone. In contrast, we were successful in generating such responses when using DC matured with both BCG and IFN-γ. This suggests that some of the properties acquired by the DC through the addition of IFN-γ during maturation better equip DC to stimulate naive T cells. We have attempted to address the relative contribution of known co-stimulatory molecules to one of the systems in which we can measure both T cell proliferation and IFN-γ production by the T cells, namely the mixed lymphocyte reaction. A combination of antibodies to CD54, CD80 and CD86 almost completely abolished T cell activation, irrespective of how the DC were matured and which readout system was chosen to measure activation. This suggests that the addition of IFN-γ during maturation has not changed the basic requirements for the DC-T cell interaction, and that CD54, CD80 and CD86 are required. One major result of the addition of IFN-γ is the stimulation of IL-12 p70 and in some cases, reduction of IL-10, secreted by the DC. We have tested whether IL-12 is responsible for the increased levels of IFN-γ production by the responding cells in the MLR, and indeed observed a reduction of IFN-γ production by the T cells in the presence of anti-IL-12 antibodies if the DC were matured in the presence of IFN-γ. The fact that IFN-γ levels were not completely abolished by this treatment suggests that other factors could be responsible for the induction of IFN-γ secretion by T cells. These factors could include chemokines such as IP-10 [47, 48]. Recent reports have illuminated the induction of IP-10 through TLR-4 agonists. BCG primarily acts through TLR-4 [19, 49] and thus is likely to induce the production of IP-10. This will be the subject of future studies. In our in vitro system, DC matured with BCG alone in serum-free media were unable to induce primary T cell responses against KLH. This finding is in contrast with observations made by others that demonstrated the induction of IL-12 using BCG-matured DC . It is important to note here that the literature describes many methods of generating DC, including the use of different media, different media additives including human or animal plasma or serum, and different concentrations of cytokines and BCG [17, 50]. We have observed functional differences at the level of expressions of co-stimulatory molecules or cytokines between DC that were generated using such different conditions, and it is possible that such differences or others that we have not yet identified could be the basis for the different success rates of the induction of primary responses in vitro. Regardless, we find that the capacity to induce such responses is recovered when IFN-γ is added during maturation. A recent publication describes that full maturation of monocyte derived DC requires 4 days of exposure to TNF-α . In our studies here we only exposed the DC to maturation stimuli for 18–24 hours, and full functional maturation with BCG may therefore require the presence of IFN-γ. The use of different maturation factors is only one way by which the quality of DC for active immunotherapy can be influenced or improved. In this study, we discovered that the addition of IFN-γ during BCG-induced DC maturation induces IL-12 and, in some instances, inhibits IL-10 secretion. Such treatment also differentially affects the nature of recall versus naïve antigen-specific T-cell responses. We have devised a protocol that uses materials compatible with clinical use, and that generates highly potent DC which confer Th1-like characteristics onto the responding T cell population. These findings greatly enhance the potential of BCG-matured dendritic cells for use in cancer immunotherapy. The authors thank Mr. Paul Crosby for his technical assistance, and Dr. Patricia Lodge and Dr. Alton Boynton for their comments on this manuscript. GS conceived the study and carried out experiments depicted in Figures 1, 3, 6, and 7. LAP performed the experiments depicted in Figures 2, 4, and 5. MLB co-conceived the study and participated in its design and coordination. All authors read and approved the final manuscript.